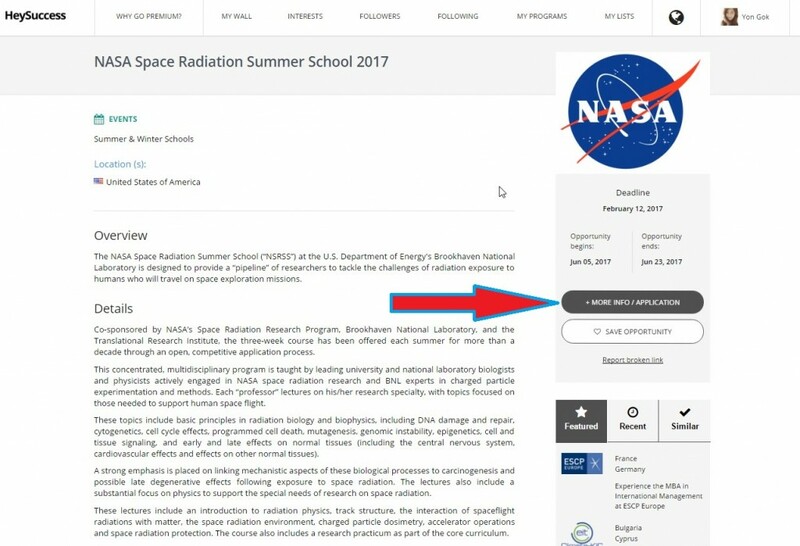 How to never miss any student program or a deadline? I am sure you know the feeling when you found out you just missed a deadline for a great internship in Europe or a fully funded trip to the United States. When I was a student I missed many opportunities, but that was in a pre-HeySuccess world. That was one of the main reasons why we decided to create HeySuccess and bring dozens of thousands of the international student programs to one site. We created a network of recruitment partnerships and innovative technology, but that is something you should not bother about. 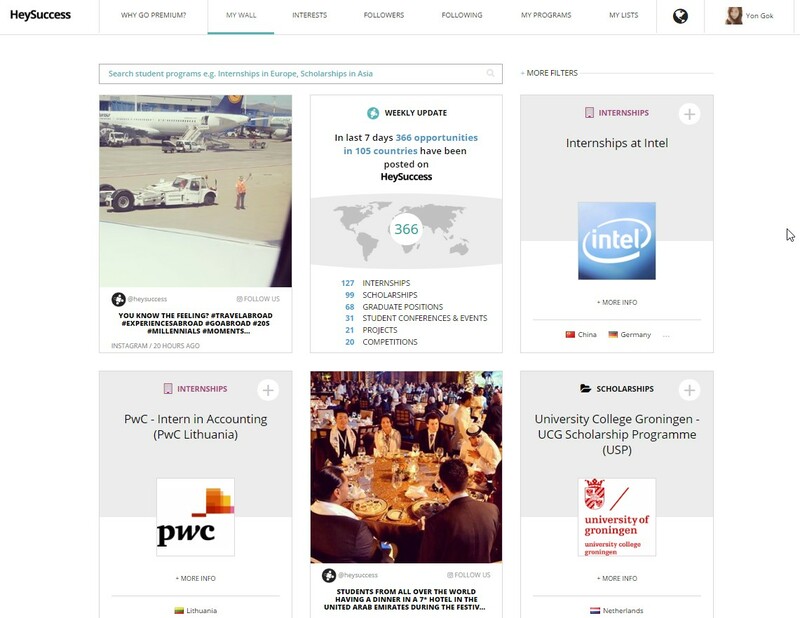 The important thing is the end result for you: easily accessible opportunities according with your personalised criteria and eligibility from around the world. No more wasting time on hundreds of messy web sites and Google search, and still miss most of student opportunities. We are proud to introduce two unique HeySuccess technologies. Those two technologies will make sure you never miss any opportunity or a deadline. First visit HeySuccess.com and during the Sign-up process, you will tell us your Citizenship. Citizenship is very important criterion for student programs abroad, because not everyone is eligible for the same internships, scholarships, student events. We are the only web site on the internet, that can pre-filter opportunities for you based on that important criterion. We are sure that you know the pain and frustration when you finally find a program you like and then you realise your citizenship is not eligible to apply. No more wasting time on that either! 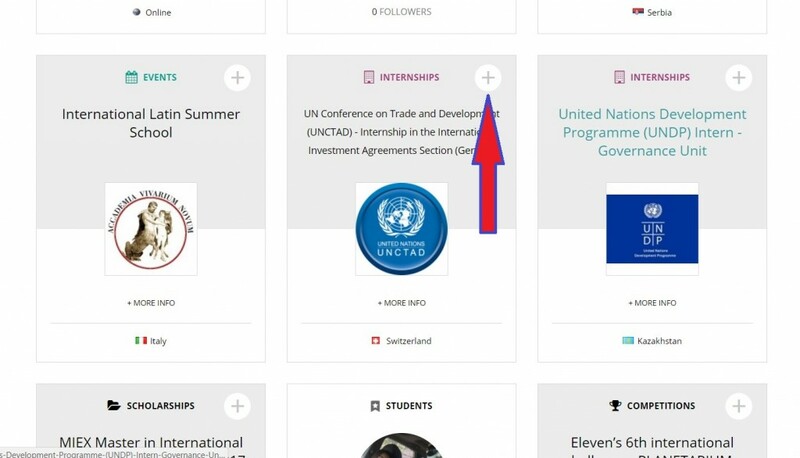 Now on your Wall, you have listed relevant opportunities based on your Citizenship along with ton of other cool content (application tips, other users, instagram stories..). Next, on your wall you can use our super-fast Search Engine. For example, you are looking for fully funded conferences. Just type: fully funded conferences in the search engine and press ENTER. 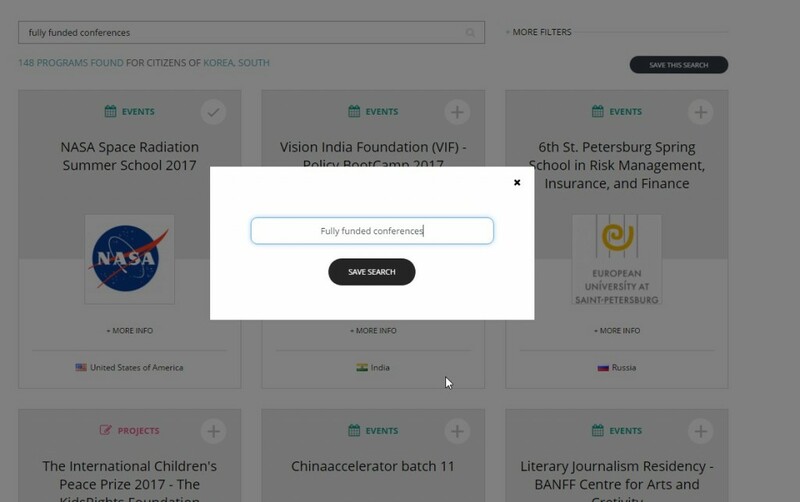 Now just simply press the button SAVE SEARCH, write a short note, for example Fully Funded Conferences and the magic can start! We will send you email every 2-3 weeks to inform you about all of the newly added opportunities, which match your saved criteria. 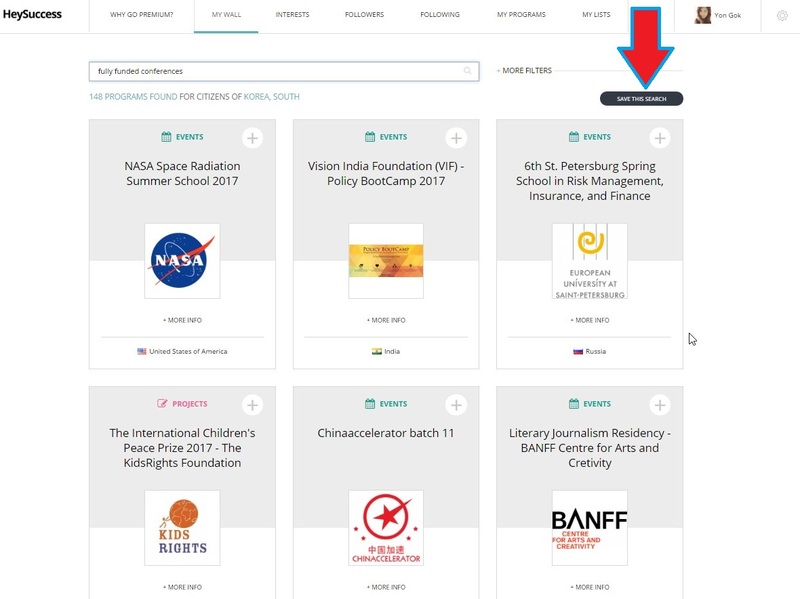 You can save as many notifications with as many search criteria as you like. 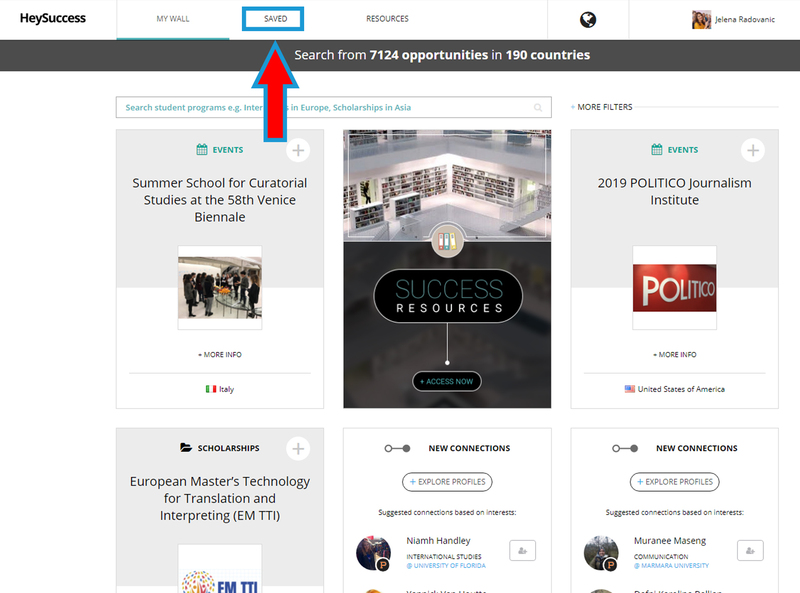 Be sure we will always inform you about newly added opportunities, which match your search results. Therefore, no way you will ever again miss any student program abroad. You can find all your saved criterion under the menu SAVED. How about missing deadlines? That is even more painful. But not anymore! When you find an opportunity with a concrete opportunity, just save it by pressing this button. Or you can simply save opportunities you like directly on the Wall, by pressing the sign +. We will inform you few days in advance that deadline is approaching and you should submit your application quickly. You can find all saved opportunities in My Programs. Enjoy the world of unlimited opportunities! And never ever again miss any great opportunity or a deadline!